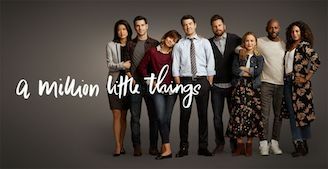 A Million Little Things, ABC’s new family drama created by DJ Nash, follows a group of friends trying to make sense of an abrupt departure of their trusted leader who seemed to have everything. Why did Perfect Jon (Ron Livingston) jump to his death? Why didn’t they know he was hurting? Was there something more they could have done? Stricken with guilt and regret, his friends and family struggle with the devastating aftermath. How do they even move on without knowing the reason why? Gary (James Roday), an insurance agent, reluctantly takes over the honcho role while a stay-at-home Dad Eddie (David Giuntoli) and Rome (Romany Malco), a lost soul, are not entirely sure if the group will survive without Jon. After all, Jon was the one who shepherded them through thick and thin. Katherine (Grace Park), Eddie’s businesslike wife, and Regina (Chritina Moses), Rome’s wife, deal with the tragedy in an altogether different manner. The bereaved family, wife Delilah (Stephanie Szostak) and two children, host a wake allowing mourners to walk all over the house with their shoes on despite Jon’s particular pet peeve. The two outsiders are Ashley (Christina Ochoa), Jon’s assistant, who seems to know more than she lets on, and Maggie (Allison Miller), Gary’s fellow cancer survivor, who happens to be a clinical psychologist specializing in depression and offers fresh perspective to the bereaved. I know a thing or two about depression. My ex put me through the wringer when he confessed he had been looking for a place to kill himself. In the deep fog of depression and spiraling further down into the abyss of anger, he was more unreachable than ever before. He was laid off and couldn’t even hold an entry-level job; his self-esteem was down in the dumps. I had to be his caregiver as well as breadwinner to float our boat called ‘marriage.’ I drove over two hours everyday for this crummy part-time job while wondering if he was successful in the deed today. There is no word to describe the angst I felt every second of the day. Is today the day I find him dead on the beach? Or is he going to jump off a building? That was way above my pay grade, but I tried my best to keep our boat afloat even with a big hole at the bottom. Oh, the horror! Little did I know he had an exit plan; he jumped ship and that’s that. Memories of angst and despair came rushing back to me when I watched the pilot. Yes, it was a little too close to home! Although my ex’s family blamed me for making him sick, I have a clear conscience; I knew the depth of his anger and suffering and did all I could to help him. I took our wedding vows seriously…’for better or for worse, in sickness and in health.’ So, in a way, I may be better off than Delilah. I just can’t imagine the guilt that will follow her for the rest of her life because…wait, I can’t give away the final big reveal! You’ll see. I definitely cannot live with myself if I were in her shoes. Just sayin’! You be the judge. A Million Little Things premieres September 26 on ABC. This is a show for adults only.